"Tau foo fah" or soy bean curd is an all-time favourite in my family. We used to buy this sweet dessert from a hawker who goes around our housing estate in a tricycle. Made from soya bean, it is rich in protein. It is soft and silky smooth which is suitable for the old and the young as well. I like to eat this warm while the children like it cold. It is such a refreshing dessert to have on a hot day. 1. Place cane rock sugar into a small pot. 2. Add in water and the pounded ginger. 3. Boil until the mixture has thicken and look syrupy. 1. 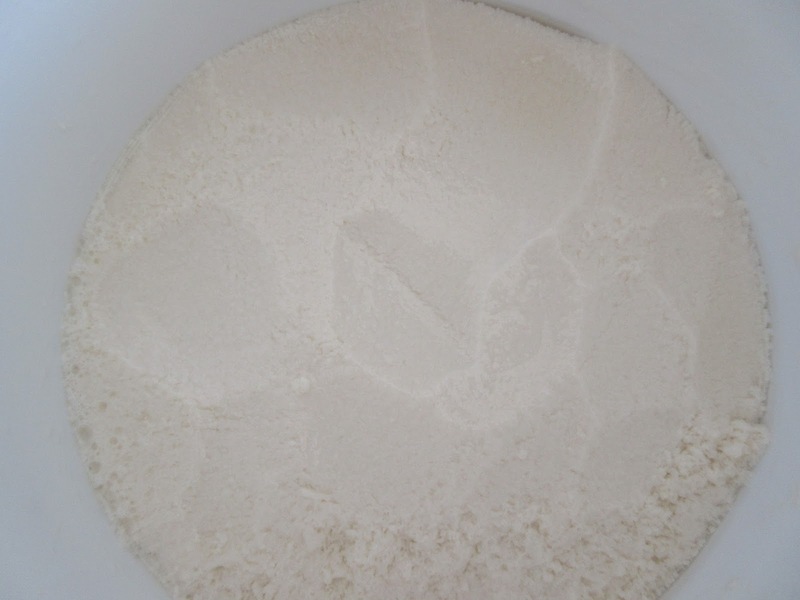 In a bowl mix gypsum powder, corn flour and water until well combined. Ensure mixture is well blended. 2. Bring fresh soy milk to a boil. Skim off the foam and bubbles. 4. Stir the gypsum mixture and pour it into a large pot with a fitting lid. 5. Pour boiling soy milk into the gypsum mixture from a height of at least 1 foot from above. This is to ensure even distribution of the gypsum mixture. DO NOT STIR. 6. Cover the opening of the pot with a towel and place lid over it. 7. Allow to set for at least 1 hour. 8. When it has set, remove the top layer which is foamy. 9. 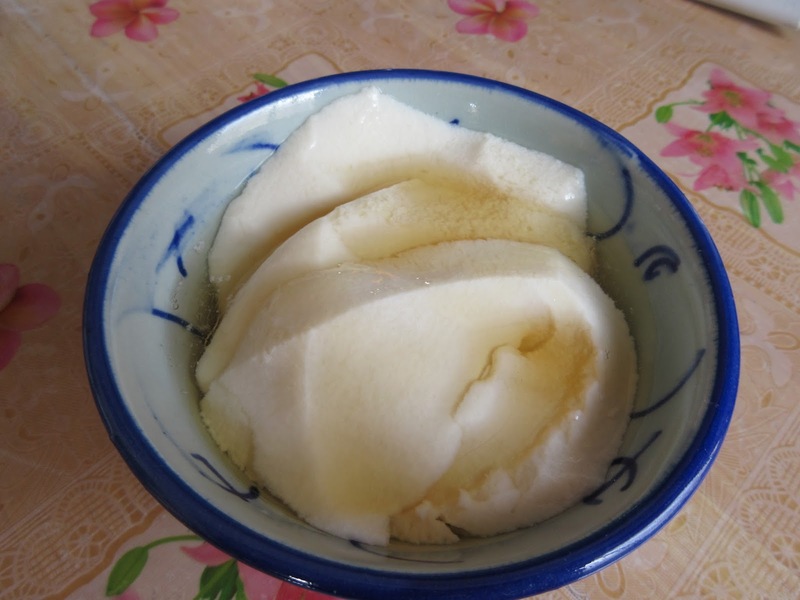 The layer below is firm and silky smooth bean curd. Remove the topmost layer which is foamy. 1. Scoop a few spoonful of the bean curd into a bowl. 2. Add 1 to 2 tbsp ginger syrup, according to taste. may i know which herbal shop did u get your 'sek koh fun'? cos i hathankve asked a number of herbal shops, but was told they don't sell it. many thanks. I bought mine at Tuck Min Medical Hall located at No. 21, Jalan Camar (60), Kepong Baru, Kuala Lumpur. I love this desert. It's good for both hot and cold weather days. But this is a complex thing. Try making it, you'll not regret it. 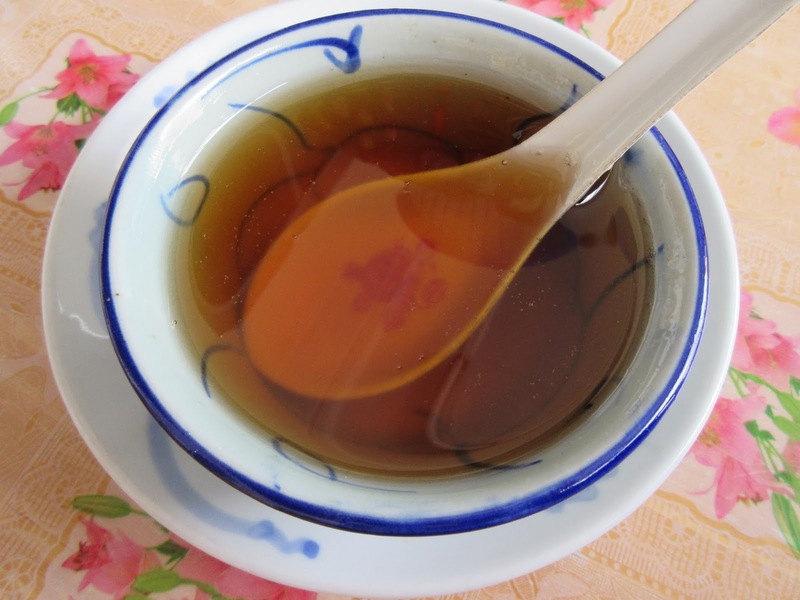 Got much more and perfect idea from you about Soy Bean Curd . Now it's time to make this one. Thanks for your co-operation by sharing the whole hack about this bean curd. I wish you success at your very first attempt. Electronic cigs have been on the market for a while, but on 'reputable' sources, such as news organizations, the FDA, and other organizations speak against them. Which I don't understand basically the electronic cigarette comes with a nicotine cartridge like the patch that gives you a dose of nicotine, only the e-cig vaporizes it, and it tastes like real smoke, so the worst thing I'm seeing here is, well nicotine, which are in cigarettes but in other cigarettes there are 1000s of other chemicals and carcinogens. I appreciate your blog and another helpful blog about the vape pen thank you for sharing this. Thank you the information about the weed pen and it's really very interesting and helpful well done. Well done and nice job ex client work and useful information about the vape pen, nice job. E Liquid Reviews - Who Has The Best Out There? I've never tried this recipe, but this is looking quite interesting to try. I would Definitely try it. Looking Delicious, feeling my mouth watery.